VSS (Virtual Simulation Systems), out of Australia, wanted to create a training and simulation product that would cater to soldiers using scoped weapons for applications such as sniper shooting. They sought to provide the most realistic training experience possible. Because of the nature of sniper shooting, and the precision skill level that is necessary, a high-fidelity tracking system was an absolute must for a realistic sniper simulator. They accomplished this by using their dynamic software and integrating the Polhemus G4™ tracking system. VSS created the MK2 Sniper Simulator. Its development is the result of close collaboration with VSS and the Australian Defense Force. The MK2 offers a wide range of uses and capabilities. Capabilities include: sniper team engagement, tracking and engaging realistic moving targets, mil-dot holds on linear targets, rapid re-engagements, and missed target drills. One of the most important and unique things about the MK2 Sniper training is that it can be used with a soldier’s own field weapon. This eliminates inconsistencies with training when using different hardware, such as varying degrees of trigger pressure and differing weapon weight distribution. Using the MK2 Sniper with a soldier’s actual service weapon is simple. The MK2 is compact and easily attaches to the front of their existing scope. With the Polhemus G4 sensor mounted on the weapon, its movement is tracked in full 6DOF, so both position and orientation are tracked seamlessly. The trainee views the magnified virtual world through the scope, just as they would in live training or operations. When shots are fired, this is reflected in real time using simulation software by VSS. The software offers dynamic real-world location scenarios, and ballistic effects that are accurately modeled and replicated. The high-fidelity tracking technology, combined with the VSS software creates an engaging virtual world and delivers a complete and realistic training solution. The Polhemus G4 motion tracker is an integral part of this total solution. Because G4 tracks in full 6DOF with a high degree of accuracy, trainees are able to practice as they would perform in a live operation. 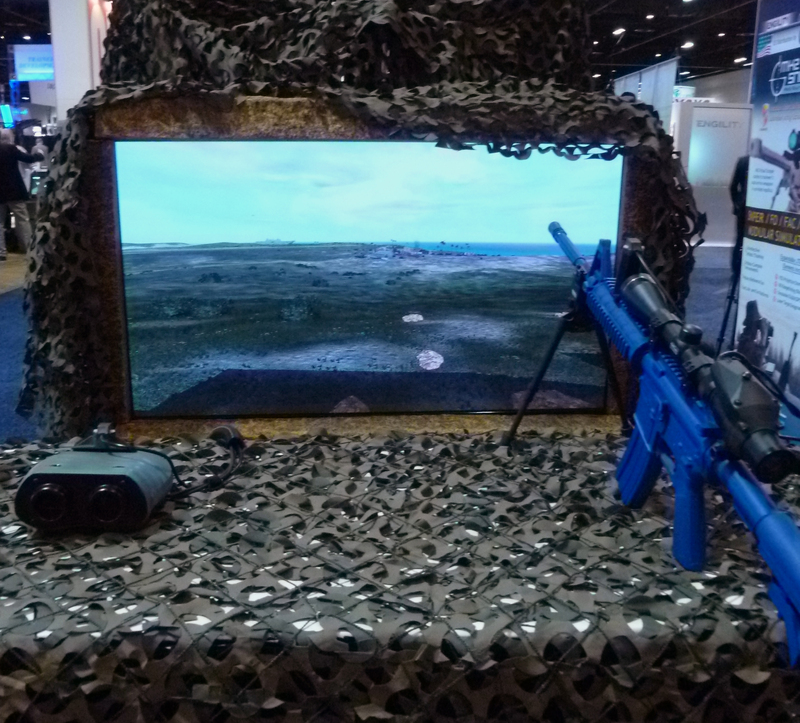 The MK2 Sniper Simulator can be used by itself as a sniper training tool, or additional components can be added. Adding VR binoculars or modular projection domes enhance the product capabilities further, enabling additional inputs and layers to be added to the training experience. There are numerous benefits to using the MK2 Sniper Simulator. Training in a virtual environment allows for a conservation of material resources; without the need to shoot countless rounds of live bullets during training sessions, significant cost savings are achieved. Additionally, a virtual reality training environment is by far the safest setting for training soldiers, eliminating the possibility of accidents, and providing the ability and option to do virtual training runs prior to live training. Another major benefit is flexibility. Previously, training in specific, complex environments were a challenge due to cost constraints, available manpower and location settings. With MK2, the environment is replicated via the software, and the real-time tracking enables a training experience that mimics a live operation environment like never before. Contact sales@polhemus.com for product information.